Are you a patron of Bob the Squirrel? Why not? I want to keep Bob and Squirrelosophy as vibrant as possible. To do that, I need breathing room. Breathing room where I don’t have to worry about taking a paying gig over putting a bit more time into a Sunday panel or an extra Squirrelosophy panel, or if I just feel the need to do some video and need a piece of equipment. I’ve had Bob on Patreon since January of this year. Currently, I have 12 wonderful patrons willing to donate their hard earned money to something they think is special and worthy of their support. I cannot begin to tell you how humbled and wonderful that makes me feel. Every little bit helps and is appreciated. Bob isn’t going anywhere. You as a fan can expect the same quality as always. But with your support through Patreon, Bob can grow. You will be a Patron of the arts! And, as a patron, you will get benefits that others do not. Cool stuff. Really cool stuff… and stuff that’s so cool I haven’t even thought of it yet. The more support, the more cool. Check out the Bob Patreon page when you can. There is absolutely no pressure to commit. 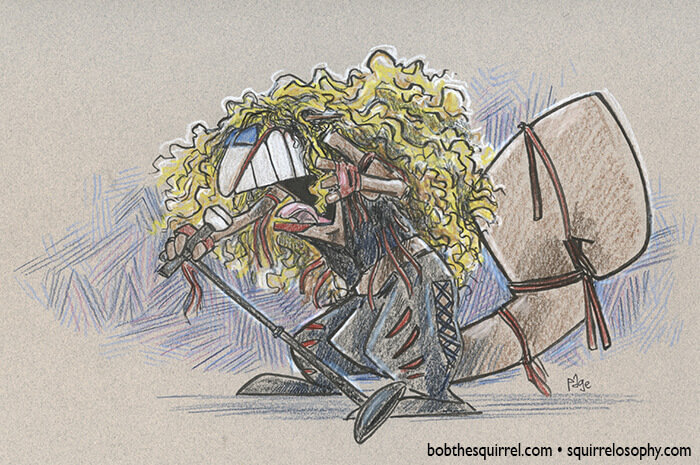 Support Frank Page creating Comics that Squirrels can dance to and not be embarrassed. I’ve had Bob on Patreon since January of this year. Currently, I have 11 wonderful patrons willing to donate their hard earned money to something they think is special and worthy of their support. I cannot begin to tell you how humbled and wonderful that makes me feel. Every little bit helps and is appreciated.